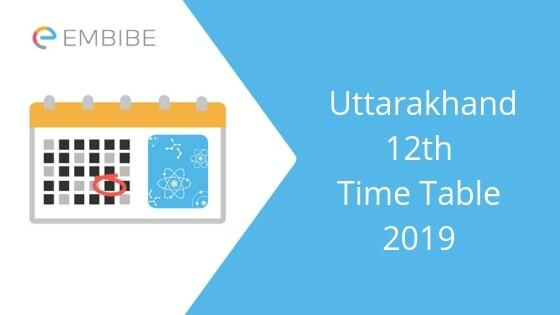 UK Board 12th Date Sheet 2019: The Uttarakhand Board of Secondary Education or UBSE released the official date sheet for class 12 on 3rd January and will be conducting the exam from 1st March 2019 to 26th March 2019. The exam will take place over a period of 26 days. As it is an intermediate examination, getting a good score here is a must so as to get into the best of colleges and streams. To keep you updated on the dates of the exam, we bring you this article on UK Board 12th Date Sheet 2019. How To Download UK Board 12th Date Sheet 2019? The steps to download the UK Board 12th Date Sheet 2019 are as under. This will help you in downloading the official 12th date sheet. Step 1: Visit the official website of UBSE: ubse.uk.gov.in. Step 2: Click “Examination Scheme” from the right side of the screen. Step 3: A new page consisting of various date sheets will open. Click on the link which says Uttarakhand Board Examination Scheme – 2019. Step 4: The UK Board 12th Date Sheet 2019 will open on the screen in PDF. Download the date sheet and take a print out of the same for future reference. The UBSE will tentatively release the UBSE Class 12 admit card in the 3rd or 4th week of February 2019. The hall ticket will be released on the official website of UBSE. Students are advised to download the admit card as soon as it gets released to avoid any technical snag in the last minute. There will be no offline admit card available for the students. Students must carry their UBSE 12th Admit Card with them to the exam center failing which they will not be allowed to sit for the exam. This article on UK Board 12th Date Sheet 2019 gives you an idea about the schedule of the upcoming exam. Now you can prepare a balanced study plan. If you are from the Science stream, you can take Class 12 PCMB Mock Test on Embibe for your preparation. You can also solve Class 12 PCMB Practice Questions on Embibe for free. Make the best use of these resources and you will definitely do well in the upcoming exam. If you have any doubt regarding UK Board 12th Date Sheet 2019, do let us know in the comment section below and we will get back to you soon.